Alaska Teacher Placement Forums • View topic - Apply for License Before Job Fair? I am going to the anchorage job fair this March. I’m a licensed administrator in Oregon, should I apply for an Alaska admin license before I go? I’m willing to go to any location? Very flexible. Would a school district consider me a serious applicant with an out of state license? Re: Apply for License Before Job Fair? It never hurts to have your certification or "yellow card" (document from EED stating that your file is complete and being evaluated) prior to any job fair, and can really help. That said, if you are licensed in another state, you will be treated as a viable candidate at any of the ATP job fairs. Teacher candidates in a pre-service program who are expected to graduate in the spring are also considered viable candidates by districts at these events, and they can't even actually apply until graduation, typically. Teachers and administrators do not have to be Alaska certified to APPLY for a job, but do need to have their Alaska certification in place before they start work. This means that the later in the season it gets, the more important having your license or "yellow card" becomes, as the districts will need to make sure that they hire people who can be ready to work when the school year begins. The Anchorage job fair in March is relatively early in this cycle, and you'll have plenty of time to get your license converted prior to the new school year. Most Alaska school staff start in early August, and school typically starts third week in August. 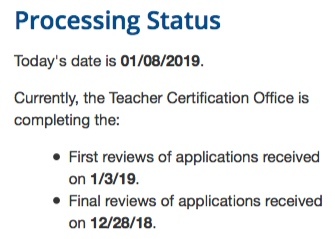 That school start date varies by district, but is the "drop dead" date for teachers to have their Alaska EED certification up and running. Turnaround times for certificate processing at EED varies by time of year, and it clearly posted on their website. This time of year, it's very fast. Here is a screen shot of their site with the posted status of a couple weeks between submission and "final review". The bulk of new teachers are hired between March and May, and this means that despite EED's best efforts, processing times can be longer as May and June approach. If attending the June ATP Job Fair, I would say candidates should already have started the process, or be getting their "institutional endorsement" - the required form your certification program / university has to sign as part of your Alaska application - by the end of that month. Not necessarily a deal killer, but it definitely helps for late hiring due to the ever narrowing gap between submitting your application, and the start date of school in Alaska. For the spring job fairs, though, I think candidates who have a "reasonable expectation of certification" will be in good shape. 2) Enrolled and making adequate progress in an accredited pre-service teacher preparation program (ideally NCATE approved) AND expected to result in certification and/or an "institutional endorsement" PRIOR to mid-summer. When I went to job fair last spring, school districts liked that I had my yellow card. It proved to them that I was serious about wanting to teach here. You could still be offered a job without it, but that card gives you a bit of a leg up.